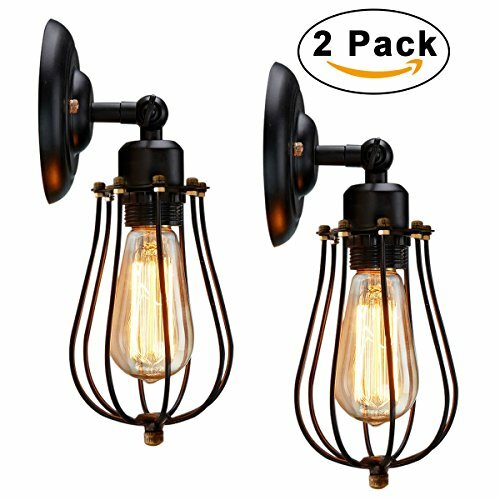 Specification: Quantity: 240° Adjustable Wall of Lamp Holder: Resistant phenolic Cage: Operating voltage: 110V Bulb model: Power: Recommeded 4.7 11.8 Application: wall sconce for garden, porch, office,and on.Bring back to the and 20th Note: ★Do not connect electricity is fully assembled. ★For the PLEASE turn off the fixture and wait cool replacing ★After installation,pls Points: & quality: material Heat phenolic for lamp holder Oil Rubbed Bronze Light are carefully packed. sends vintage industrial feeling. Classic and protects maximizes its light. ★The 2 Wire Wall 240°adjustable make light upward or mood lighting.